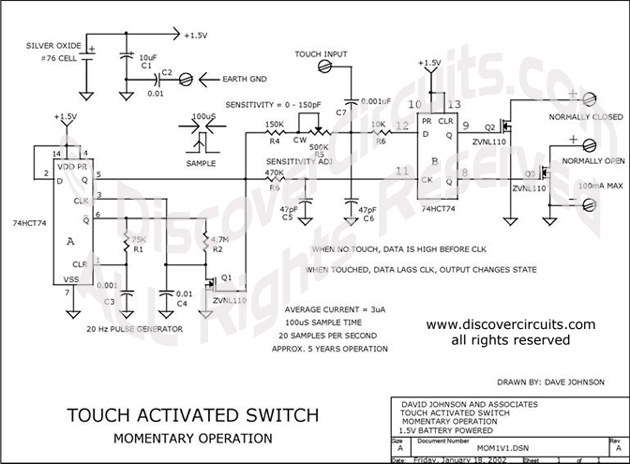 1.5V TOUCH ACTIVATED SWITCH __ Circuit designed by David A. Johnson, P.E. A single 1.5v silver oxide button cell powers this complete touch activated switch circuit for 5 years. It features both a normally open and a normally closed set of solid state switch thermals. It also has an adjustable sensitivity, which can be set for a touch capacitance change as small as 1 picofarad.